Merry Gramblemas all my grambling chums out there in Grambleland. This week is the special Christmas edition of The Grambler which basically means it is the same as every other week except it is longer. And you get sprouts with it. I toyed with starting us off with a gramblerised version of a popular Christmas song, but there are so many to choose from – Grambling Around the Christmas Tree, Grambling Merry Christmas, Peace On Earth/Little Grambler Boy, I Saw Mommy Grambling Santa Claus [steady on – Ed], Grambling in the Air, Stop the Gramblery – just too many. So I thought, sod it. That’s not in keeping with the festive seasoning, is it? Oh, you’re back, are you? Anyone else want to put in their tuppence worth before we start grambling? Oh, hello, Dougie (the local inebriate). Ah’m gonnae huv a kin brilliant Christmas, so am ur. Ah’m kin gonnae get kin blootered on mulled Buckie! Kin brilliant, man! Er…How do you mull Buckfast? How the f*** dae ah know? We just kin mix it wi voddie. Kin magic so it is. Me an ma buds jist get kin oot wur brains wi it. Kin mad wi’ it, man. So just like any other day, then? Ehm…I suppose ye’re right. Kin brilliant! I think it’s time to get on with some grambling. This Saturday - 21st December – The Grambler has only 54 senior games to choose from. Being Christmas, the schedules are all to pot. Hardly any English Premiership games are in the 54. Anyway, I am now just waiting for Arthur to give me this week’s predictions….Won’t be long….Talk amongst yourselves….Where the devil is he?....Ah, here he comes. Arthur, have you been drinking? Well, it is Christmarse. That lovely chap, Dougal just let me have a little sip of his, what’s it called? Mulled breakfast. Very nice. Belch! Yes, well, as long as you’ve brought the predictions. Fear not my good fellow, I have them right here in my hand…hang on, that’s a cocktail sausage. I can’t have eaten them, surely. I put them somewhere for safekeeping. Now where was it? Oh. I remember. I sturffed them down me underpants. Here you are. No you hang on to them, I can read them from here. Randolph. In the middle of the goal. Randolph. In the middle of the goal. For our second game we head to the Matchroom Stadium in Leyton – named presumably after the chairman (a cockney for the purposes of this story) saw the all-seated stadium for the first time and exclaimed, ‘There isn’t much room’ – he’s a cockney, see. Pronounces his ‘u’s as ‘a’s. I do hate having to explain jokes. Actually, Orient’s chairman is Barry Hearn, owner of Matchroom Sport. Any road up, Orient play host to the Creepies. Nah. That’s not their nickname. They are known as the Reds. Prefer Creepies, myself. It would be apt because they have crept steadily up the various leagues to Division 1 (3!) after only getting to the Conference league as recently as 2004. So, The Grambler predicts this is going to go the home side’s way. I would not disagree. Orient are currently sitting pretty at the top of the table, while Crawley languish (that’s a good word) in 14th spot only 8 points ahead of bottom placed Bristol City (the well-known rhyming slang). In the 11 home games they have played this season, Leyton Orient have only lost once. The Creepies, on the other hand, have won only once on the road this season. Saying that, they have managed 5 draws away from home, so The Grambler prediction might come unstuck with Crawley taking a point here. The teams have only met twice before and both games went Crawley's way. I doubt if Orient will slip up though, all things being equal [If all things were equal, it would be a draw. Ed]. The middle game of our five takes us to Victoria Park where the Pools – or Monkey Hangers if you prefer – play host to the Brewers. The Grambler has predicted that this will go Hartlepool’s way even though they sit 16th in the table, 10 spots below Burton. Hmm. Can’t say I agree with that. The Pools haven’t won since 23rd of November and Burton haven’t lost since 16th of November. What should that tell you? In fact, Burton have a brilliant away record only losing 2 away games all season. Hartlepool have lost 4 at home, but they have won 6 and the last time they lost at home, in the league at least, was back in September. Maybe The Grambler has called this one right. But I doubt it. By the way, I think Hartlepool have our ‘player with the cracking name of the week’ in their squad. Step forward please….Zak Boagey. Isn’t that brill? For our fourth game we head down to Home Park, Plymouth where our old friends the Pilgrims play host to some other old friends, the Shakers. The Grambler predicts this as an away win and expects the Pilgrims to be ‘shaken’. Do you see what I did there? Both teams are in the bottom half of the table with only 3 places (and 3 points) separating them. So how have they fared home and away this season? First up the Pilgrims at home – 11 played, 4 won. Hmm, not very good. Next, the Shakers away – 9 played, 1 won. One?? Oh dear. Sorry Grambler, I think you’ve got another one wrong. Oh, I’ve just seen another contender for ‘player with the cracking name of the week’. Plymouth have a midfielder with the cracking name of Dominic Blizzard. And finally, Cyril? And finally Esther, we head oop north to’t Boooootham Crescent where T’York City tek ont Oxfudd Yooooooooonited. Sorry about that; I’ve suddenly gone all Geoffrey Boycott. Ahem. Start again. The Grambler has predicted that the Yellows will beat the Mister Men. Mister Men? Sorry, I meant Minstermen. Well, considering Oxford are top of the table and York are down at 20th, The Grambler may well have got this one right. Shall we bother with the stats? Don’t think we need to. Oh all right then. Right, York at home – 9 played, 5 won. Hmm, that’s not too bad. Next, Oxford away – 9 played, 6 won. That’s better – 6 beats 5. Job done. Oxford will win. So, there we have it my grambling chums, The Grambler has chosen. Once again we have gone with a 20 pee accumulator and 10 x 20 pee doubles (aka the cowardy bet). So, what will the Bobby Moore Fund receive if all these predictions are correct and Mr Bet365 pays up? Woo hoo. Maybe, just maybe, The Grambler has given us a little Christmas present…Then again, maybe not. Finally, this being Christmas, we ought to end with something Christmassy. What should it be, I thought. A little poem perhaps? Nah. What about a cute picture? A cat with tinsel? A little robin redbreast? Ahh. Nah. What should it be? Thanks to b3ta, I found the answer. 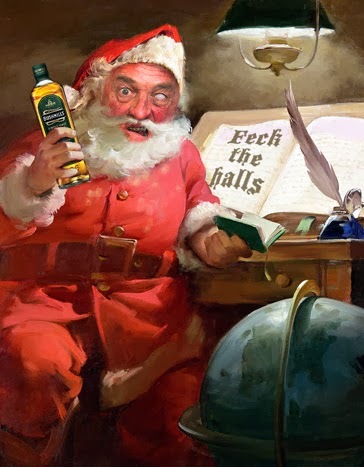 A Christmas wish from none other than Father Jack. Merry Christmas to my grambling chums everywhere.